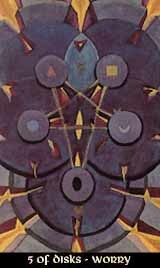 The Five of Disks finds itself in the changing movements of Geburah, but this is not the wellbalanced change of the Two of Disks, but an imbalanced, disruptive change, the effect of the 5 breaking up the stability of the 4, destroying its structure and balance. So the Five of Disks represents a material crisis, which can also be a crisis in home and profession, an illness or injury, anything that disturbs or destroys the material, peaceful security of the Four. There is not much to find when looking for the bright sight of the card, nevertheless it is a fact that every burning of a forest results in many little sprouts that appear afterwards, having the most fertile ground in the ashes. But of course, the old forest doesn't need to burn down completely - the card can also talk of the worry that it might do so just because it burns somewhere in the near.